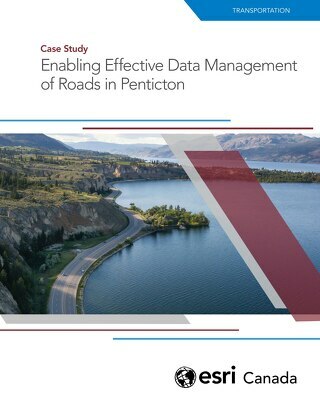 Read how the City of Penticton in BC gained a comprehensive view of its roadways by moving to a linear referencing system. 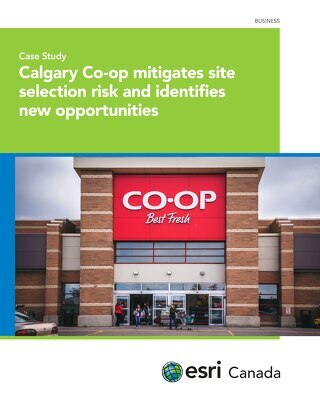 Read how Halifax created a Situational Awareness Viewer app to quickly and effectively respond to emergencies – from fires to hurricanes to hazards. 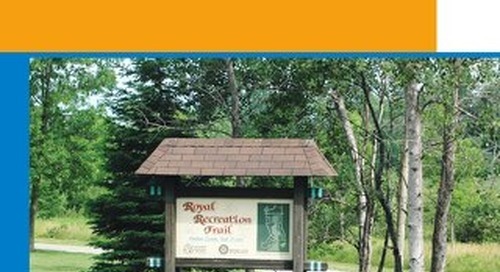 At MRC de Coaticook, implementing ArcGIS Online saves time and increases productivity; residents use online interactive apps & maps to access data. 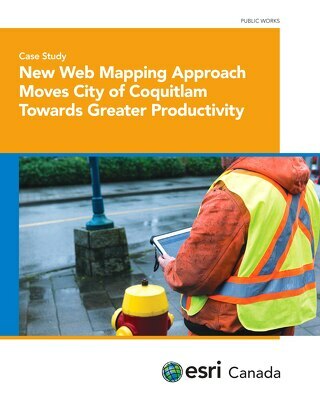 Assessment Analyst helps improve accuracy of residential property data, adding $1 billion in new taxable value for the County. 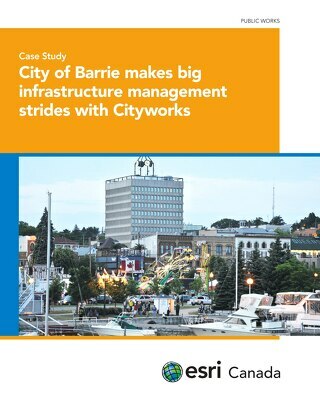 Cityworks enables growing municipality to centralize access to data and streamline asset and work management. 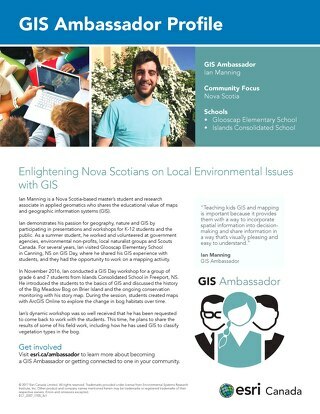 Read how Ian Manning, a Nova Scotia-based master’s student, shares the educational value of maps and geographic information systems with the public. 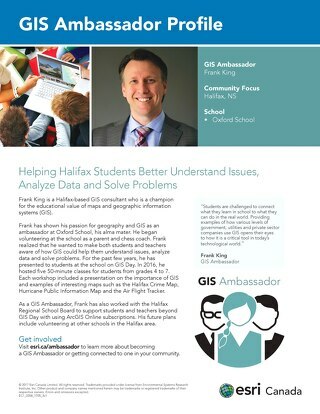 Learn how Frank King, a Halifax-based GIS consultant, shows his passion for geography and GIS as an ambassador at the Oxford School, his alma mater. 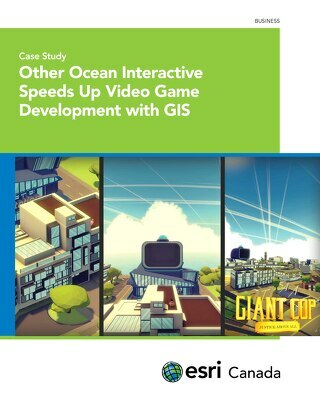 CityEngine increases game developer’s productivity on environment creation by 400%, reducing labour costs and time to market. 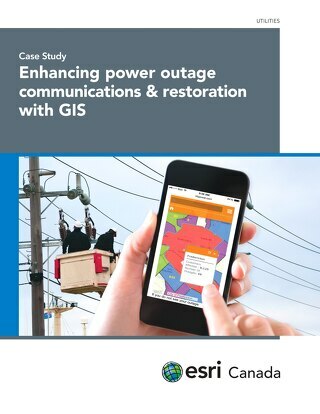 Adopting a one-map-fits-all approach to publishing web maps has been a standard practice for municipalities and government agencies for many years. 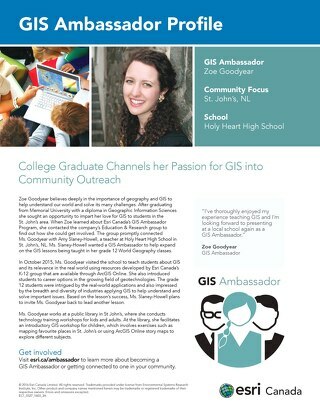 Read about Zoe Goodyear, a GIS Ambassador in St. John's, NL who believes deeply in the importance of geography and GIS to help understand our world and solve its many challenges. 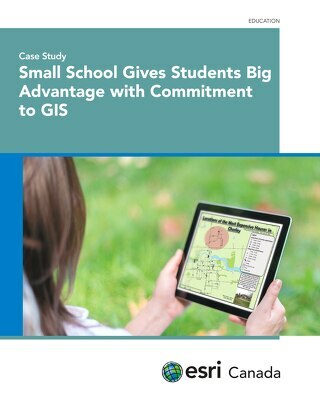 Chesley District Community School has sought to engage students in its geography program through a combination of technology and experiential learning. 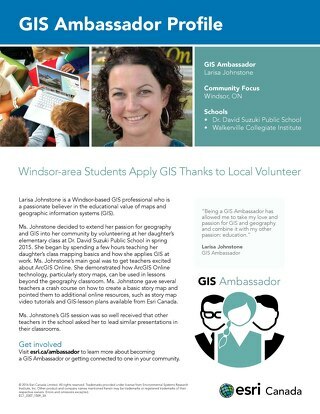 Larisa Johnstone is a Windsor-based GIS professional who is a passionate believer in the educational value of maps and geographic information systems (GIS). 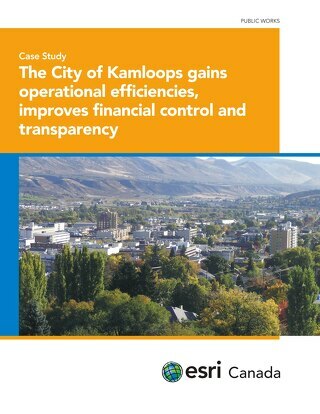 In 2009, the City of Kamloops embarked on a corporate-wide asset management program with the goal of transforming the way the City manages its corporate assets. 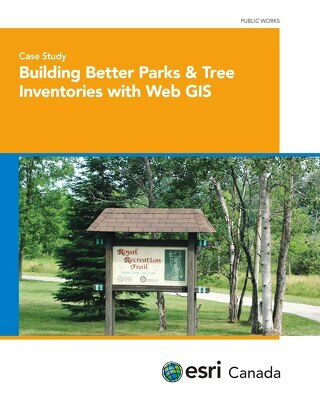 In August 2014, the City of Guelph Parks & Open Space GIS Project was initiated to improve the park inventory system and the way information related to park assets is shared. 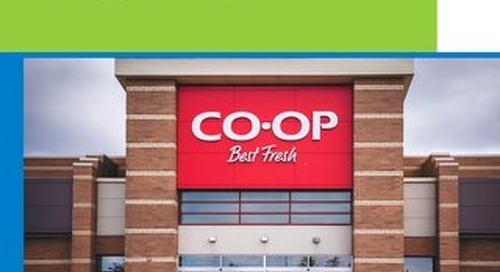 Calgary Co-op is a retail co-operative with annual sales over $1 billion that offers food, home health care, pharmacy, petroleum and travel to more than 440,000 members in the Calgary region. 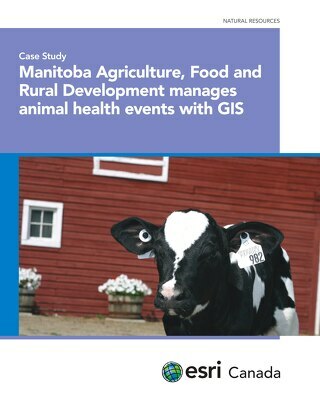 Failure to prevent the spread of animal diseases could cost Canada’s livestock industry billions of dollars. 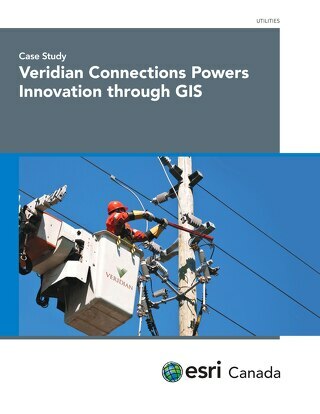 New Brunswick (NB) Power is a public utility providing power to more than 350,000 customers in New Brunswick and surrounding areas. 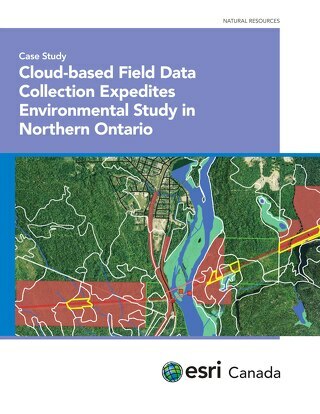 As part of an environmental study in northern Ontario, Dillon Consulting overcame these limitations by developing a digitized data collection workflow using Collector for ArcGIS. 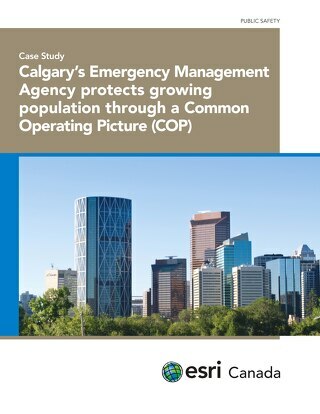 To ensure the safety of over 1 million residents, in 2011, The City of Calgary’s Emergency Management Agency (CEMA) implemented a new Comprehensive Emergency Management Model.